Jetsun Milarepa (circa 1040-1123), the 'Cotton clad' yogin, is one of the most famous and beloved poet-practitioners of Tibet. His biography and the collection of his 'hundred-thousand' songs of realization exemplify the ultimate aspiration of an ascetic life lived with intense religious devotion and practice. Milarepa's youth was marred by tragic circumstances. His father died when he was very young and his covetous aunt's family took over the family estate, resulting in great poverty for Milarepa, his mother and his sister. At his mother's instigation Milarepa studied black magic in order to avenge his aunt's injustice, which resulted in the death of thirty-seven people. Seeking atonement for these evil deeds he came under the guidance of the great translator Marpa Lotsawa (1012-1097), who subjected him to six years of intense hardship in order to purify Milarepa's karma. Marpa's relentless harshness eventually drove Milarepa to the suicidal brink of despair, when Marpa suddenly revealed that his trials were over. Then nourishing Milarepa like his own lost son, Marpa bestowed his most profound teachings and initiations to Milarepa, who then spent many years practicing in remote caves and living only on nettles until he finally attained the full realization of Mahamudra. Marpa is the founder of the Tibetan Kagyu tradition, which stems directly from Vajradhara to the Indian Mahasiddhas Tilopa and then to Naropa, who was Marpa's main guru. From Milarepa the lineage passed to his two main disciples, Rechungpa and Gampopa, with four of Gampopa's disciples founding four of the main Kagyu schools. 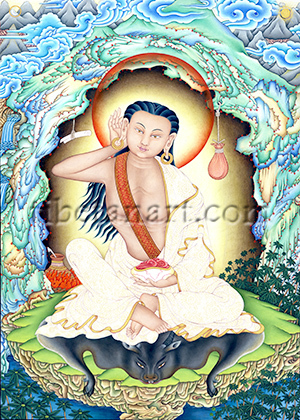 Milarepa is shown here seated on an antelope skin in his cave on the eastern face of Mt. Kailas in Western Tibet. He wears the single white cotton robe of a tantric yogin or repa, which represents his mastery of tummo - the esoteric practice of cultivating a vital 'inner heat' within the practitioner's 'subtle body'. Across his chest he wears a red meditation belt, which is used to hold the body in specific yoga postures. With his right hand he presses his ear forward in the attitude of singing one of his spontaneous songs of realization, while with his left hand he holds a skull-cup full of nectar, symbolizing the cultivation of great bliss. Around his cave grow the nettles that were his main sustenance during his long periods of retreat, with a clay pot of nettle-soup simmering behind him. Hanging from the roof of his cave are a bag of barley grain and salt, and a scroll. Marpa, who foresaw that Milarepa would reach a point of deep uncertainty in his solitary practice, prophetically gave this scroll to him and this sealed scroll contained the teachings to enable him to overcome this hindrance.